International film festivals have always been about great film and great fashion, sometimes more about the fashion and less about the movies. Take the cannes film festival, we’ve loved and sometimes loved to hate what Aishwarya Rai has worn on the red carpet. Remember the tizzy behind Mallika sharawats thigh slit lehenga outfit? and how can we possibly forget the time when the humble nose ring walked the red carpet, a small step by Sonam Kapoor, was a giant leap for Indian fashion that year. All hail then , the power of power dressing at film festivals. Now there has been a lot of talk about making Goa into the Cannes of India, now that we are to be the permanent venue of this annual extravaganca of cinema. Most people have been talking about building infrastructure and vying for bigger names to attend International film festival of India. I ask you this, does anyone, absolutely anyone ask about the infrastructure at Cannes, infact most aren’t even interested in what movies got shown, or even which film won the palme d’or ( incidentally winter sleep won the Palme D’OR the highest film award in the cannes this year, and yes you can watch it at the IFFI 2014 in Goa, it is showing at Kala academy on Friday). What most of us mere mortals and self confessed voyeurs are interested in is knowing if Ash finally let go of her stylist, and if vidya balan is going to repeat her classically stylish sari look yet again this year. If we truly want IFFI to reach anywhere close to the hype and media coverage that Cannes gets, we have got to up our style quotient. 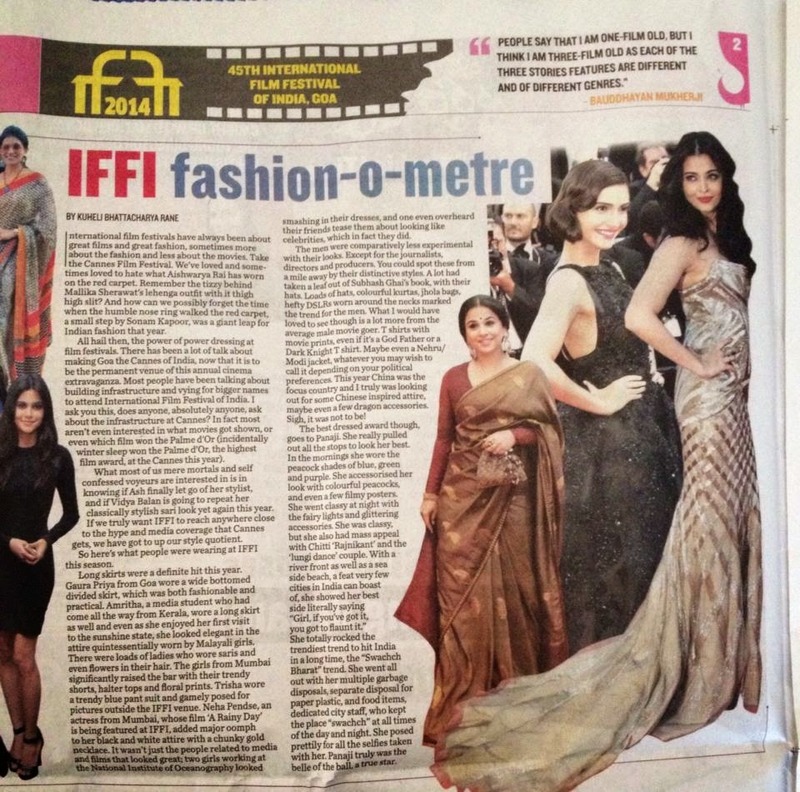 So here’s what people were wearing at IFFI this season. Long skirts were a definite hit this year. Gaurapriya from Goa wore a wide bottomed divided skirt which was both fashionable and practical. Amritha a media student who had come all the was from kerala wore a long skirt as well and even as she enjoyed her first visit to the sunshine state, she looked elegant in an attire which is quintessentially worn by the malayali girls. There were loads of ladies who wore saris and even flowers in their hair. The girls from Mumbai significantly raised the bar with their trendy shorts, halter tops and floral prints. Trisha wore a trendy blue pant suit and gamely posed for pictures outside the IFFI venue. Neha pendse , an actress from Mumbai, whose film, a rainy day is being featured at IFFI added major oomph to her Black and white attire with a chunky gold necklace. It wasn’t just the people related to media and films who looked great, two girls who worked in Nation institute of oceanography looked smashing in their dresses, and one even overheard their friends tease them about looking like celebrities, which infact they did. The men were comparitevely less experimental with their looks. Except for the the journalists, director- prodeucers. You could spot these from a mile away by their distinctive styles. A lot had taken a leaf out of Subhash Ghai’s book, with their hats. Loads of hats, colourful kurtas, jhola bags, hefty DSLRs worn around the necks marked the trend for the men. What I would have loved to see though is a lot more from the average male movie goer. T shirts with movie prints, even if it’s a God father or a Dark knight T shirt. Maybe even a Nehru/modi jacket whatever you may wish to call it depending on your political preferences. This year China was the focus country and I truly was looking out for some chinese inspired attire, maybe even a few dragon accessories. Sigh, it was not to be! Even though IFFI happens in November, the temperatures hardly drop low enough for winter wear. The best bet is cottons, linens, and trendy Indian Khadi. Accesorising is the best way to elevate your look, and I for one opted for peacock motif accessories in sync with the IFFI mascot. The funky delegate bag in white and cool blues and greens with painted peacocks is a great accessory as well. Hang your delegate badge, and sling on the bag and you look like a serious film buff. Add to that some colourful and conspicuous eye wear and you’ve pretty much nailed the look of the IFFI-ite. Footwear should be comfortable especially since it’s a bit of a hike from INOX to Kalaacademy where the movies are playing. Even with the free rickshaws plying, its still a lot of walking especially since finding a car parking takes you further away from IFFI. The best dressed award though, goes to Panjim. She really pulled out all the stops to look her best. In the mornings she wore the peacock shades of blue , green and purple. She accessorised her look with colourful peacocks, and even a few filmy posters. She went classy at night with the fairy lights and glittering accessories. She was classy, but she also had mass appeal with chitti ‘rajnikant’ and the ‘lungi dance ‘ couple. With a river front as well as a sea side beach, a feat very few cities in India can boast of, she showed her best side literally saying “ Girl, If you got it, you gotta faunt it.” She totally rocked the trendiest trend to hit India in a long time the “swachch Bharat” trend. She went all out with her multiple garbage disposals, separate disposal for paper plastic, and food items, dedicated city staff who kept the place “swachch” at all times of the day and night. She posed prettily for all the selfies taken with her. Panjim truly was the belle of the ball, a true star.